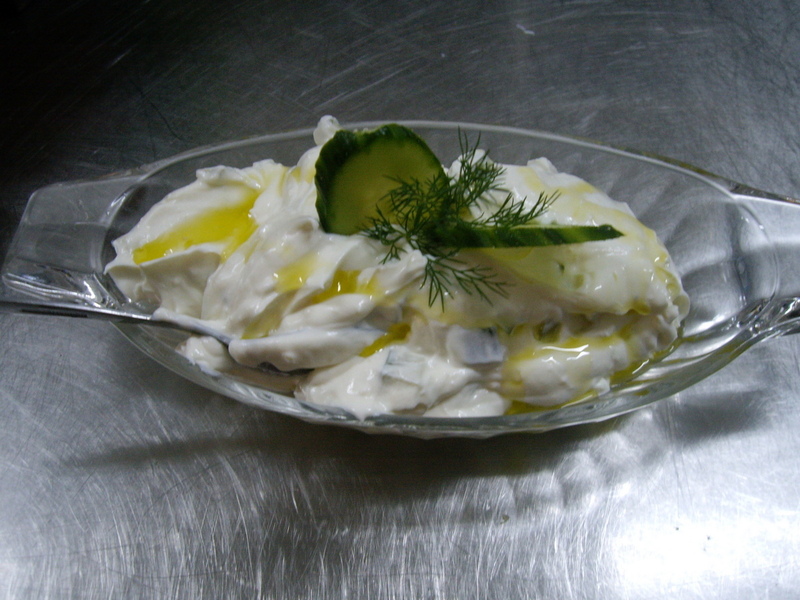 Fresh home made with strained yogurt mixed with cucumber, garlic, salt and olive oil. 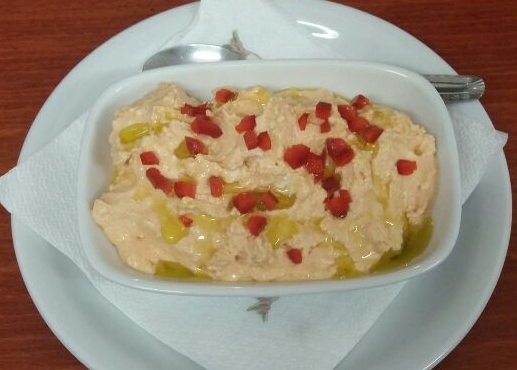 Homemade cheese dip with feta, chilli peppers, paprika and olive oil. Fresh home made dip with cod roe, olive oil, lemon juice and dill. 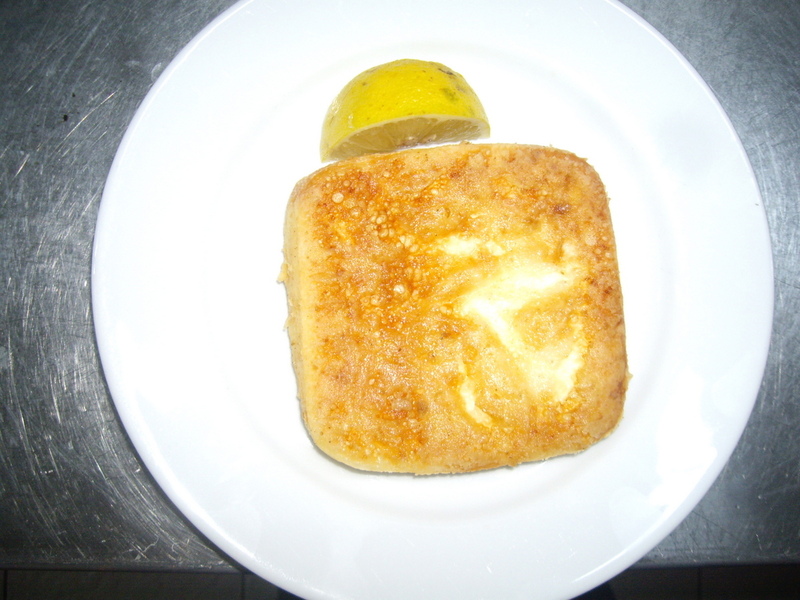 Hard cheese dipped in flour and lightly fried. 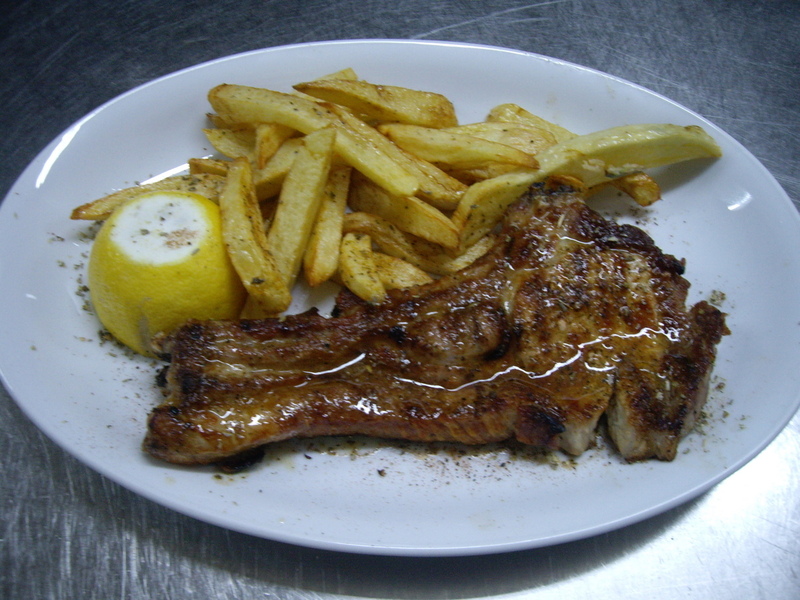 Tradtional Mani sausage with orange served with a piece of smoked pork. 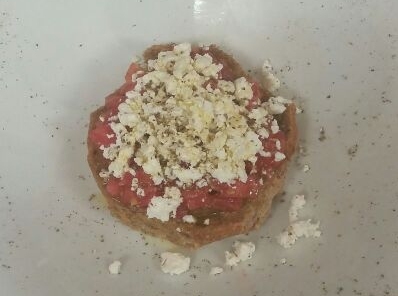 Pieces of sausage and grilled peppers cooked in a spicy tomato sauce with a feta cheese topping. 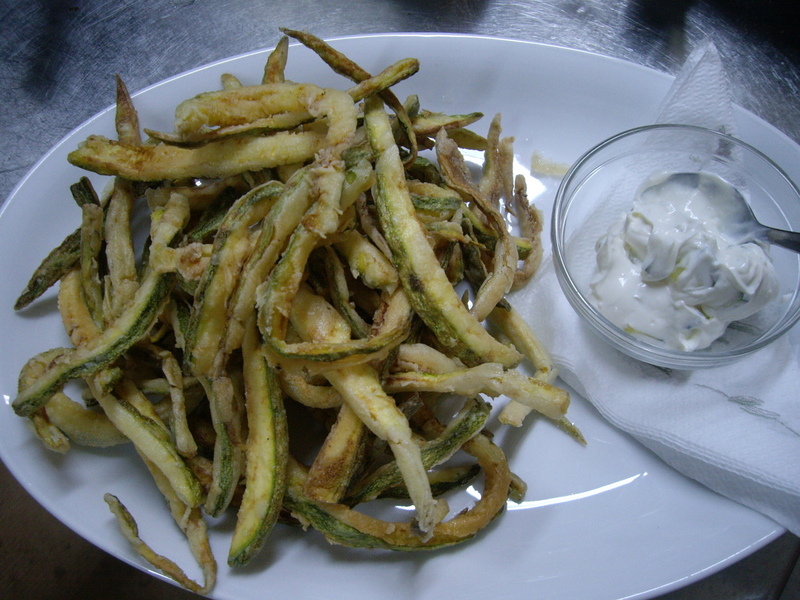 Strips of fresh courgette, dipped in flour, lightly fried and served with tzatziki. 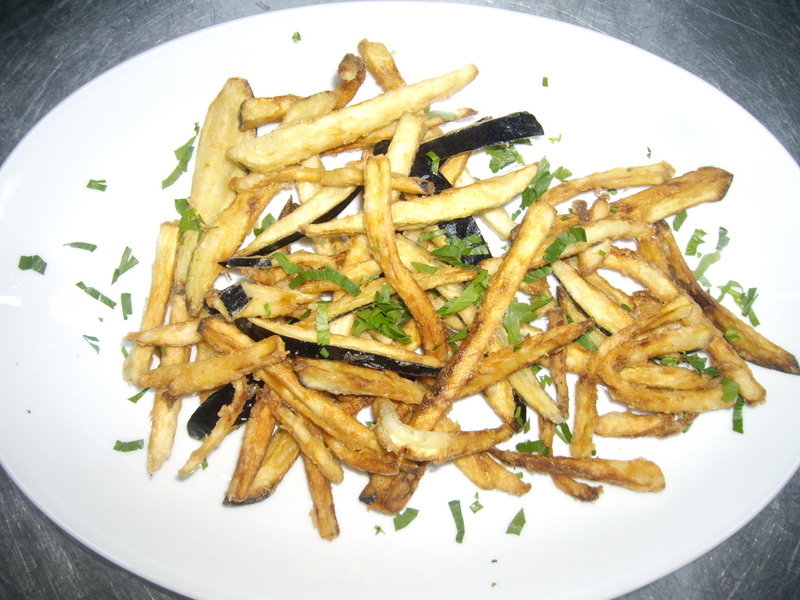 Strips of fresh aubergine, dipped in flour, lightly fried and served with tzatziki. 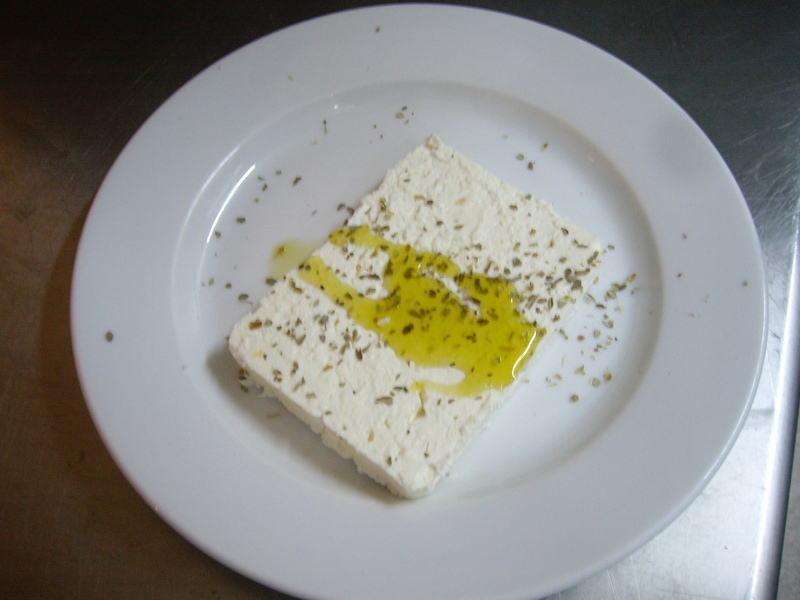 Type of rusk served with a topping of fresh tomato, feta cheese, olives, oregano and olive oil. 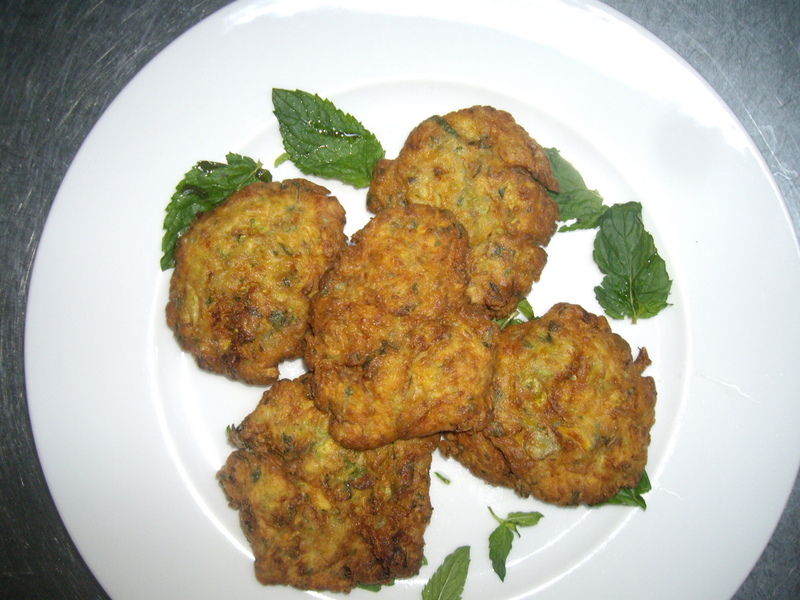 Home made dish of grated courgette, different cheeses and some herbs, shaped into patties and lightly fried. 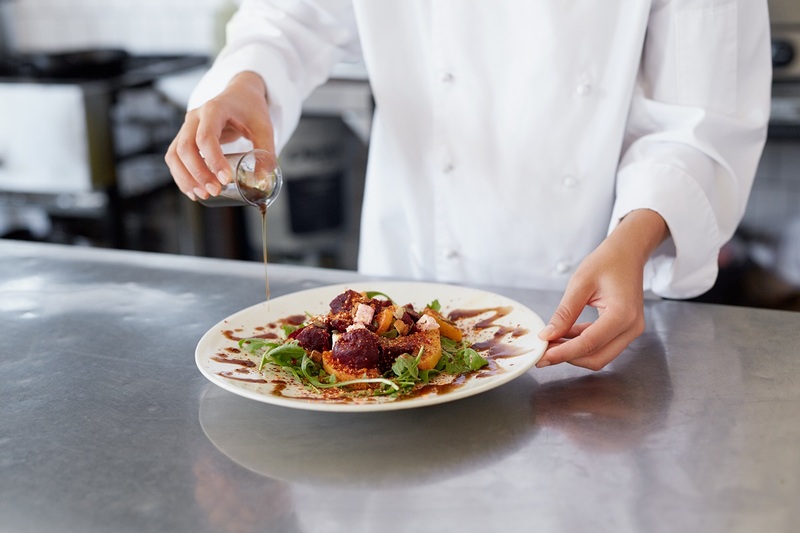 Cooked octopus served with a home made balsamic dressing. Shrimps in a home made slightly spicy, fresh tomato sauce with a feta cheese sprinkling. 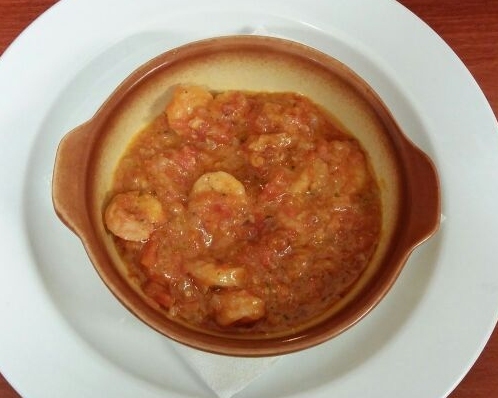 A spicy dish which includes chilli, onion, fresh tomato sauce and shrimps. 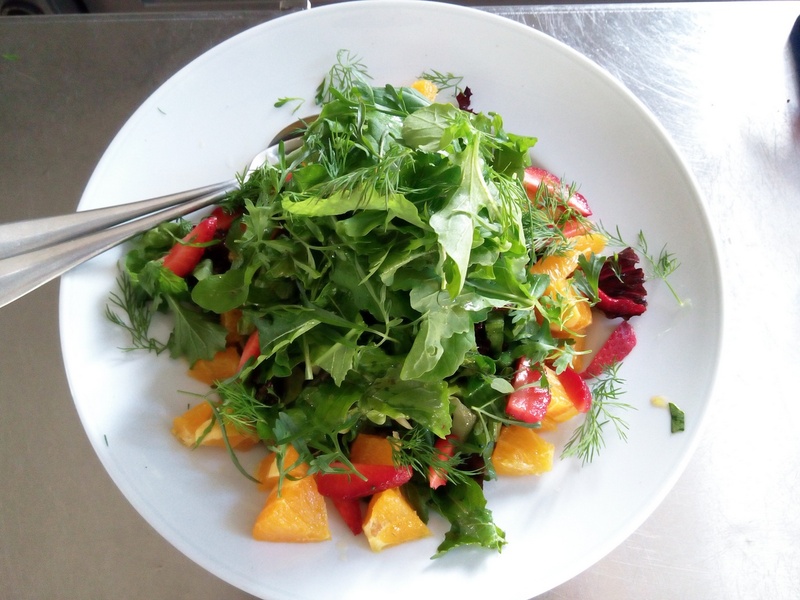 A mixture of different lettuce, rocket, seasonal fruits and tomatoes all tossed in a fresh vinaigrette dressing. 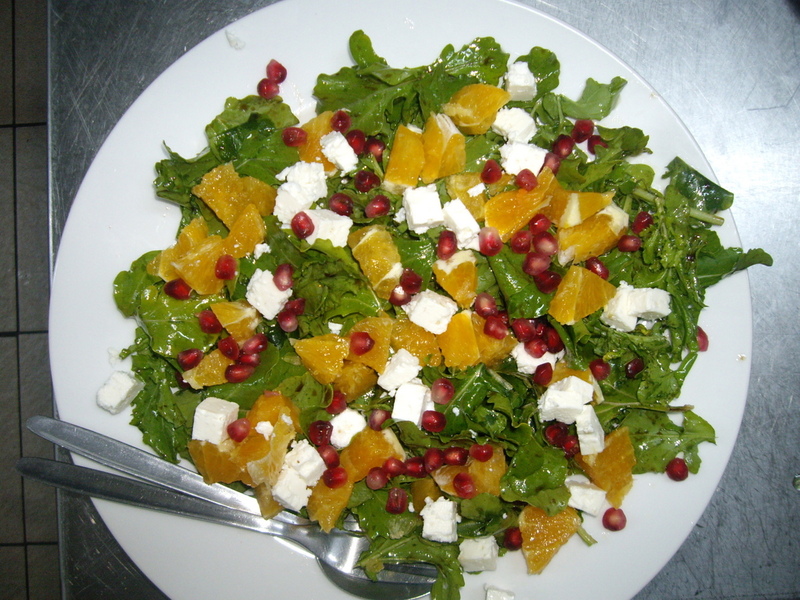 A mixture of rocket, feta cheese and orange all tossed in a home made dressing. 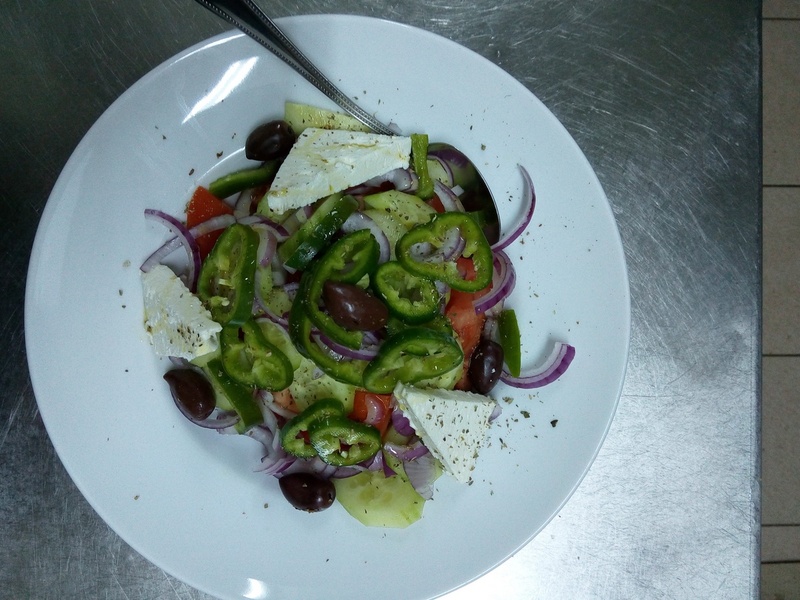 Tomato, cucumber, onion and fresh local olives topped with Greek feta cheese, sprinkled with herbs and drizzled with fresh olive oil. 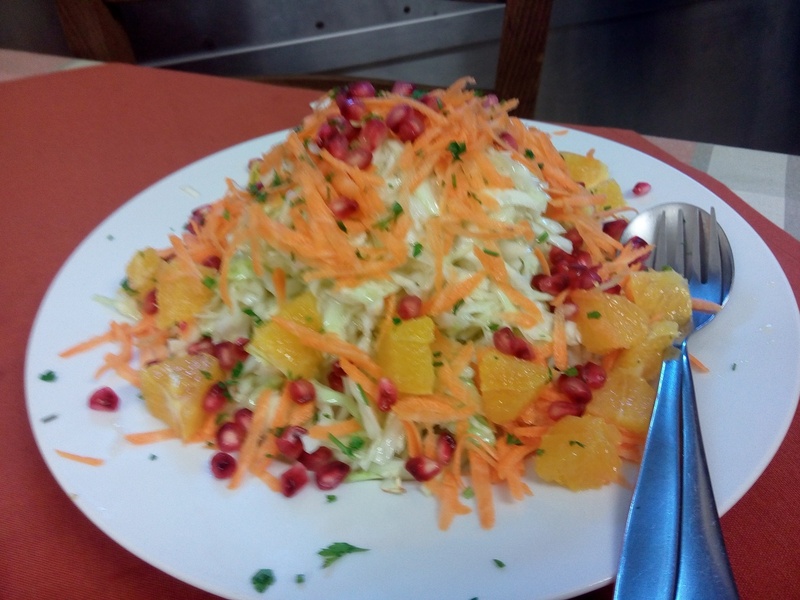 A dish of shredded cabbage, grated carrot and seasonal fruits all tossed in a home made dressing. 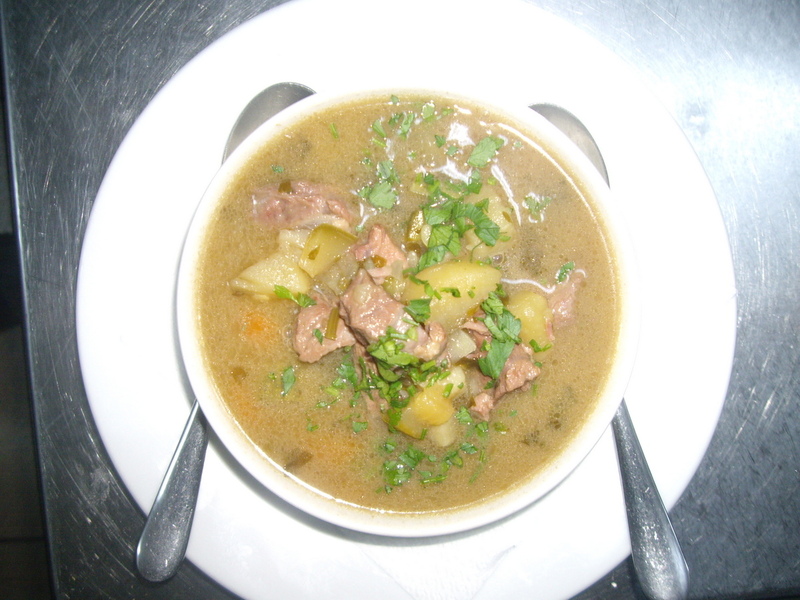 Delicious home made soup with small pieces of beef, onion, carrot, potato and celery. Home made with fresh tomato, celery, chilli peppers and carrots. 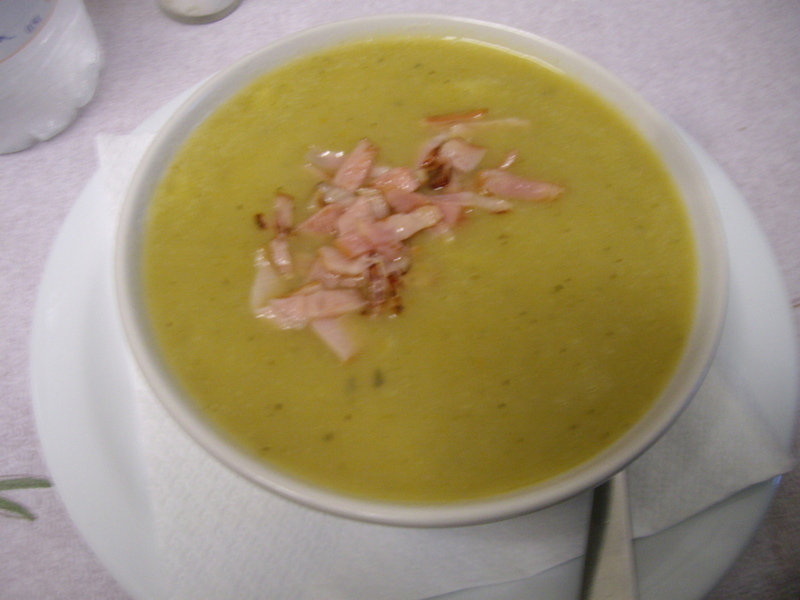 Fresh home made with potatoes, celery and carrots. Whole pepper and tomato stuffed with a mixture of rice and herbs. 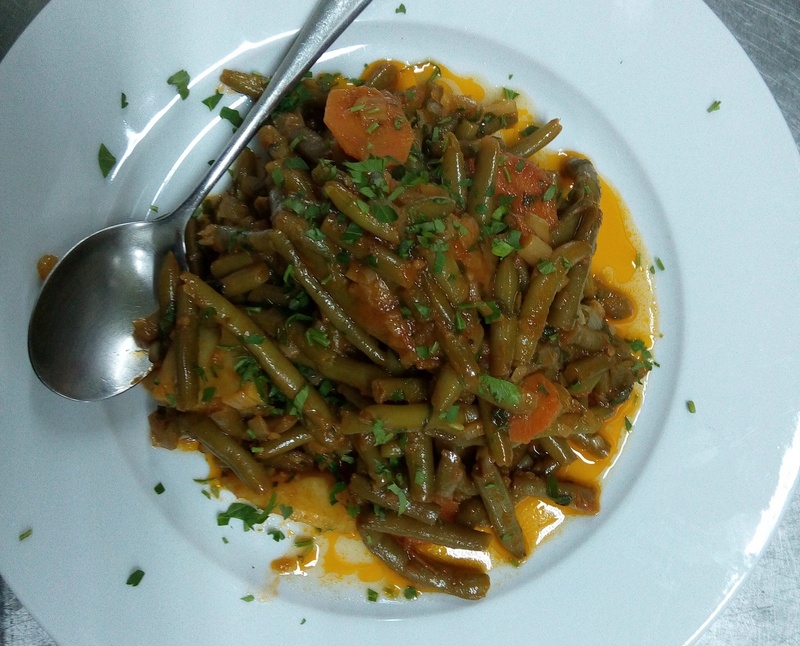 Mixture of cooked vegetables in a fresh tomato based sauce. Mixture of grilled, fresh vegetables including courgettes, aubergine, green peppers, red peppers and mushrooms served in a home made garlic sauce. 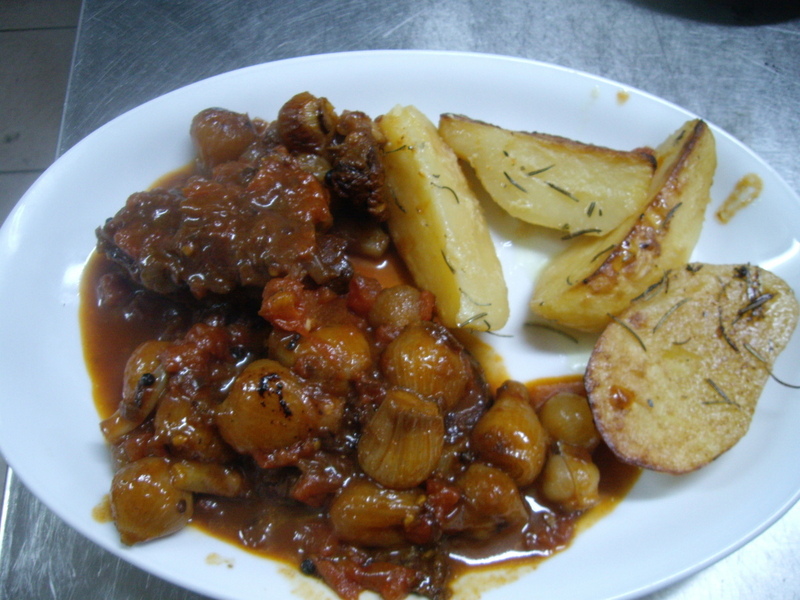 Fresh runner beans, cooked with potatoes, carrots and fresh tomatoes. 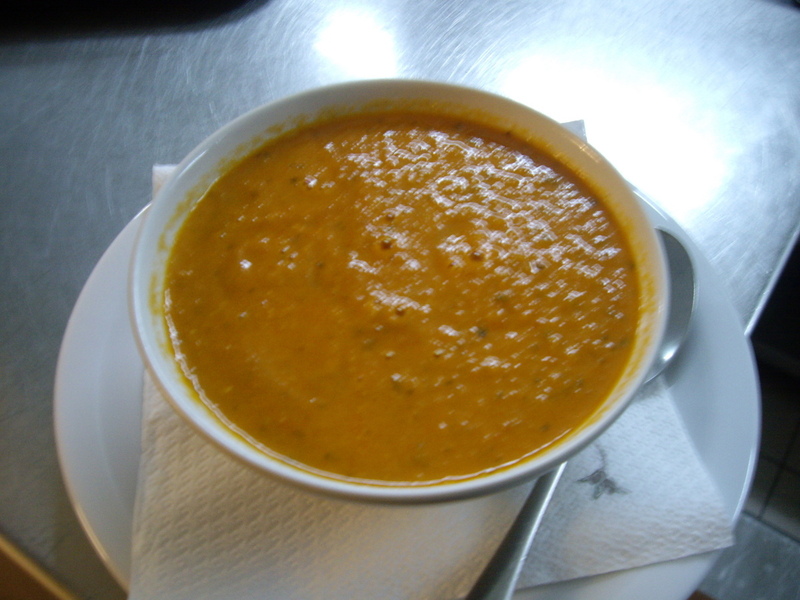 Large white beans cooked in a fresh home made tomato, celery and carrot sauce. Risotto rice cooked with seasonal fresh vegetables, drizzled with fresh olive oil. 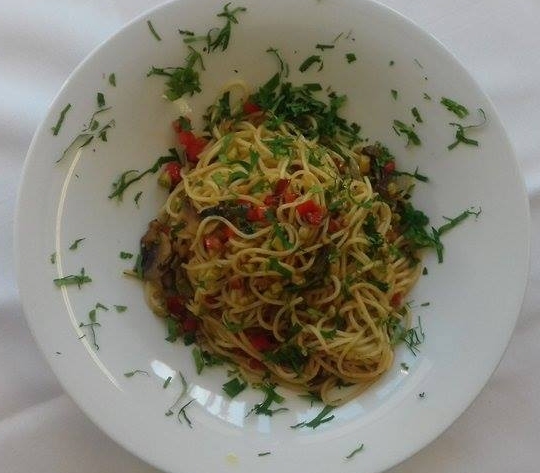 Spaghetti served with fresh seasonal vegetables, olive oil and herbs. Traditional Italian spaghetti dish in a garlic based sauce, fresh chopped tomato, parsley and chilli peppers (optional) with olive oil. Layers of pasta and fresh minced beef topped with home made bechamel sauce. 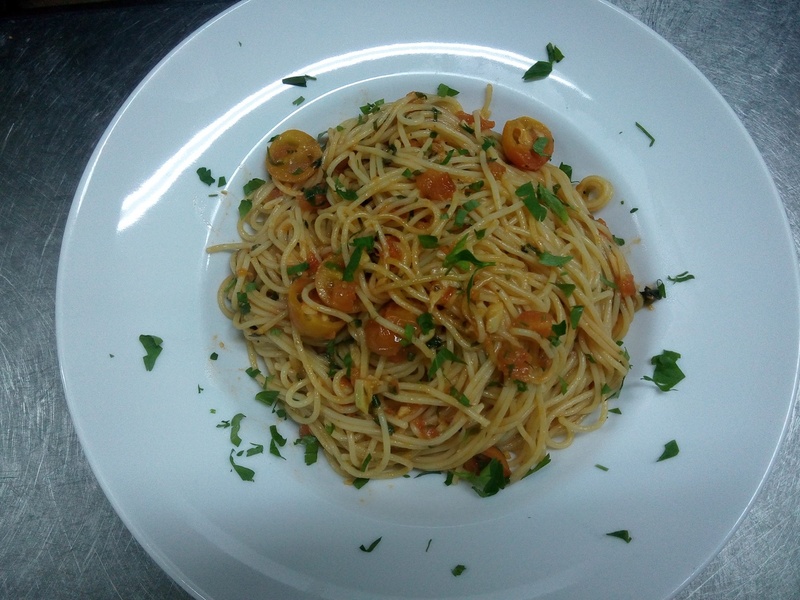 Spaghetti served with a tomato, olive oil, garlic and fresh herb sauce. 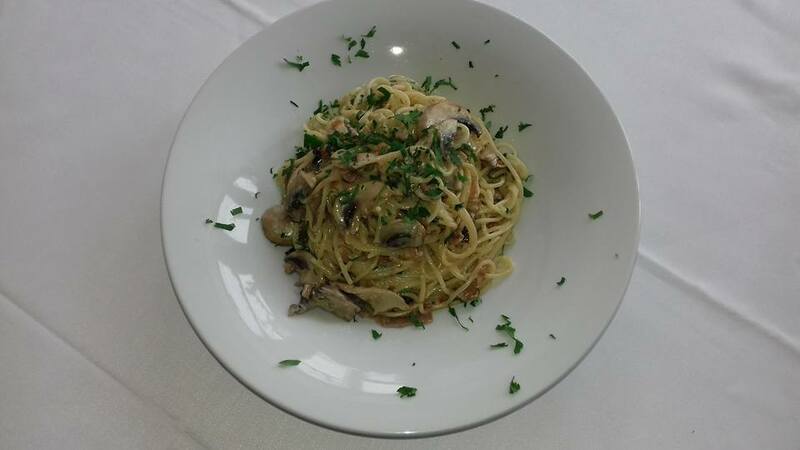 Spaghetti topped with mushrooms, bacon, cheese and fresh herbs in a cream based sauce. Salmon pieces, cooked with spinach, garlic, herbs, a little cream and spaghetti. 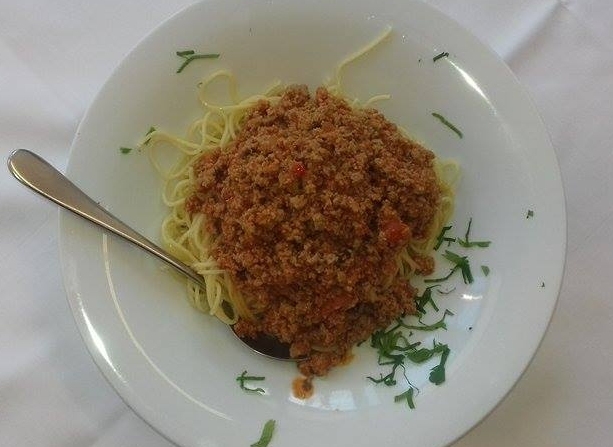 Spaghetti topped with a home made sauce of minced beef, tomato, onion, olive oil, garlic, fresh herbs and spices. 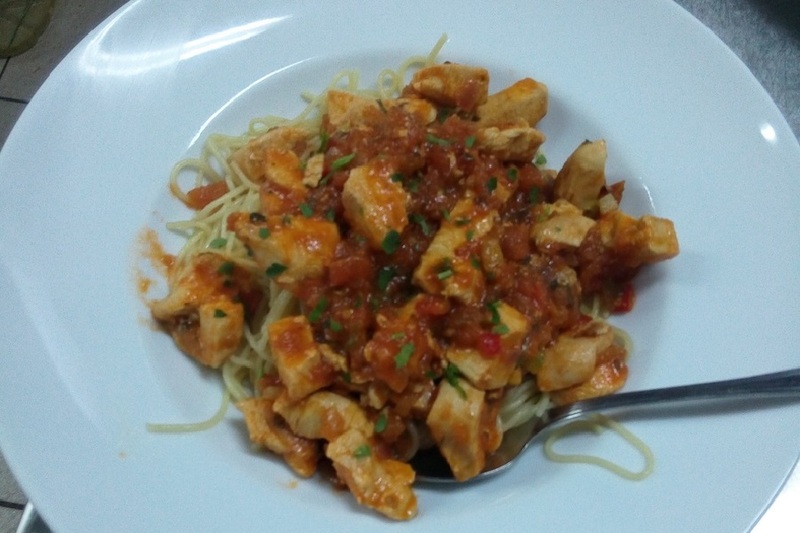 Tender marinated chicken pieces cooked with vegetables and herbs, tossed in spaghetti and olive oil. Various seafood cooked with seasonal vegetables and garlic, tossed in spaghetti and olive oil. 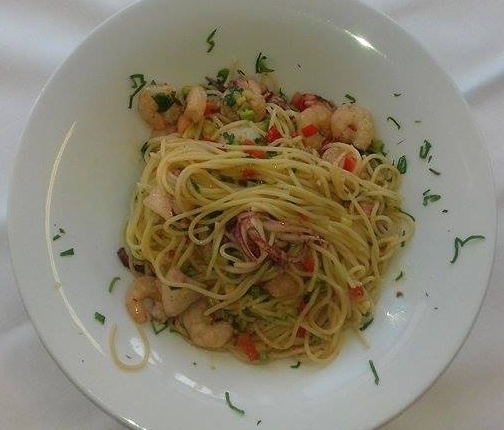 Shrimps cooked with garlic, seasonal vegetables, herbs, tossed in spaghetti and olive oil. 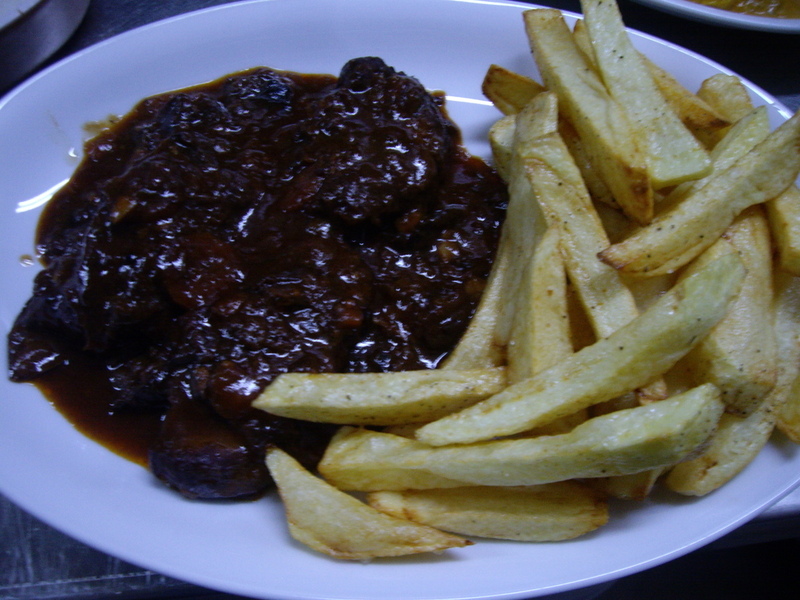 Tender beef served in a fresh tomato sauce with cloves, spices and baby onions. 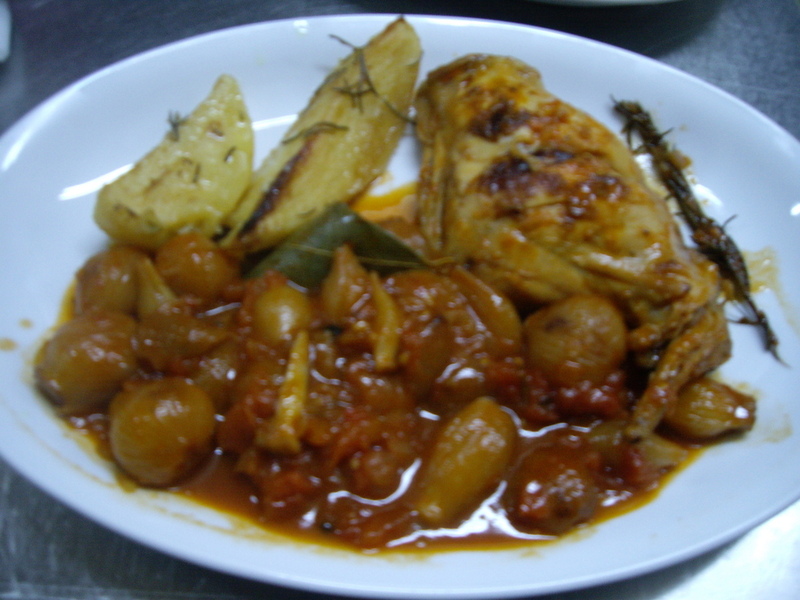 Whole piece of fresh rabbit cooked in a spicy tomato sauce with baby onions. 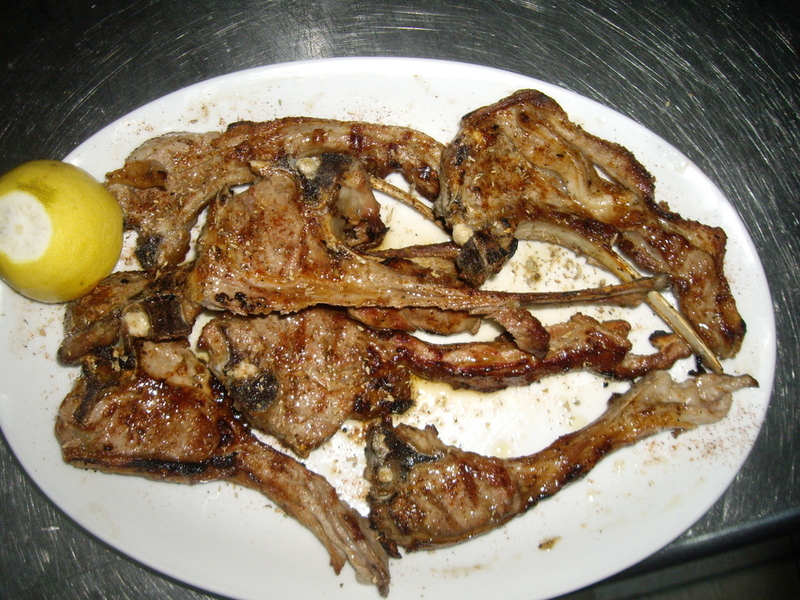 Pieces of lamb in a fresh creamy, mint sauce. 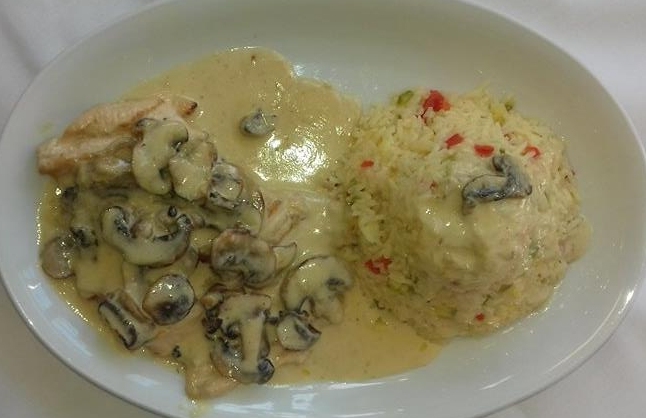 Chicken fillet in a fresh mushroom and cream sauce. 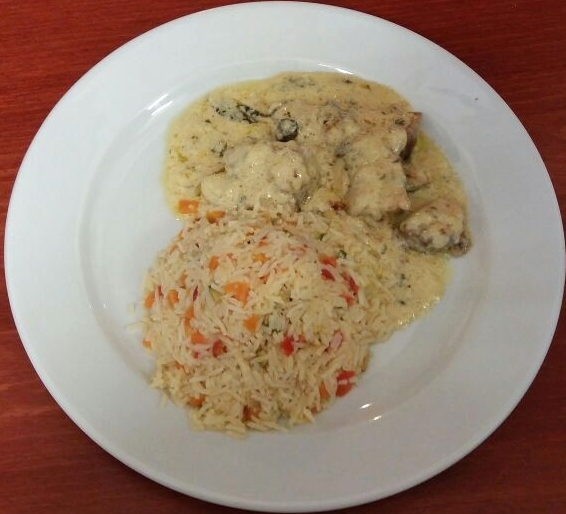 Chicken fillet with small pieces of apple, potato and sultanas served in a fruity cream sauce. 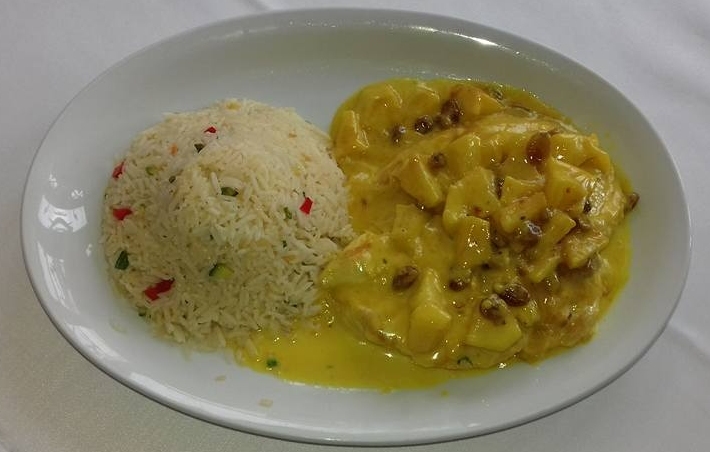 Small pieces of fresh pork served in a home made sweet and sour sauce. 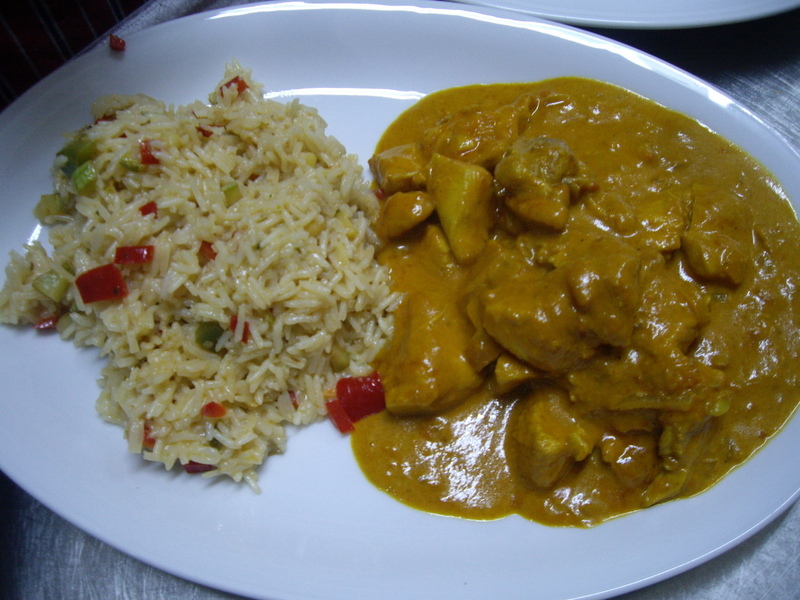 Chicken curry cooked with authentic spices and yogurt, served with special basmati rice. 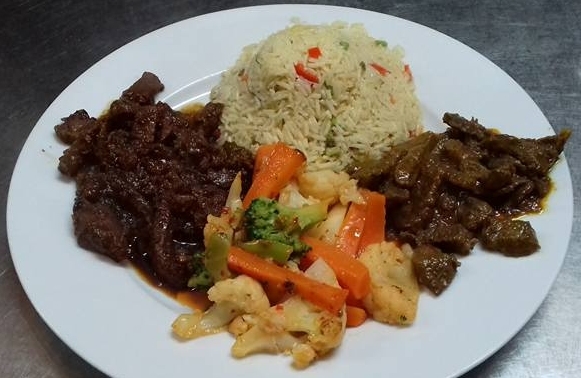 A double Indonesian dish including hot, spicy beef and pork in a sweet, black sauce, served with rice and vegetables. 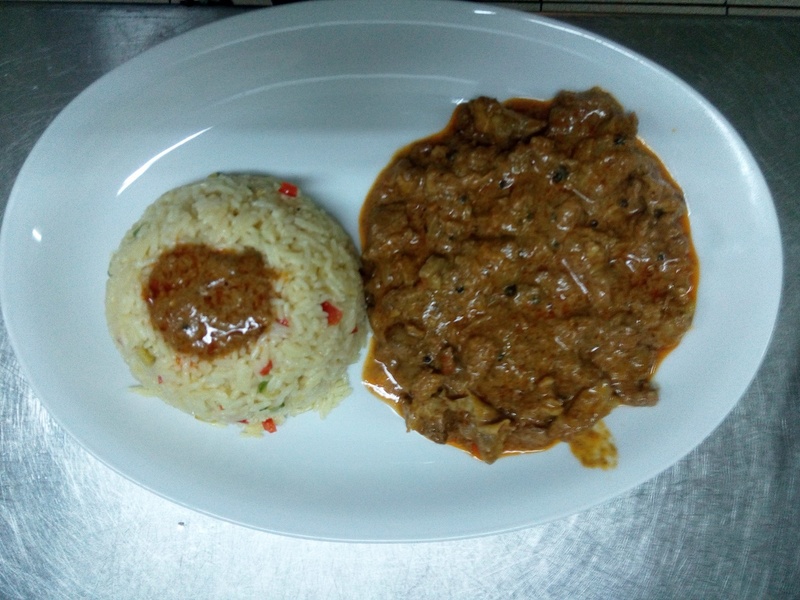 Lamb Rogan Josh cooked with a selection of spices and served with special basmati rice. 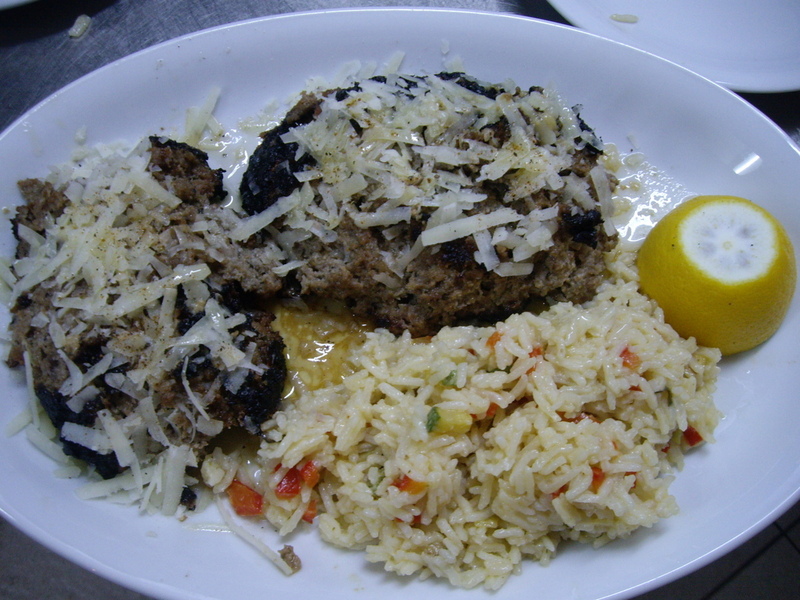 Homemade using fresh minced beef, onion, garlic and a mixture of spices. Slices of aubergine, courgette and minced beef in a fresh tomato sauce, topped with a layer of home made bechamel sauce. 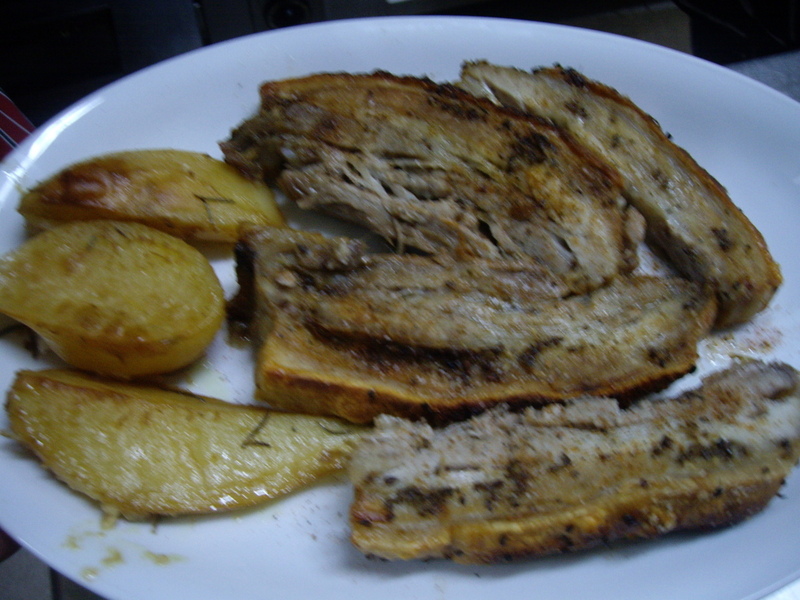 Thick slices of roasted pork and crackling, served with potatoes of your choice. 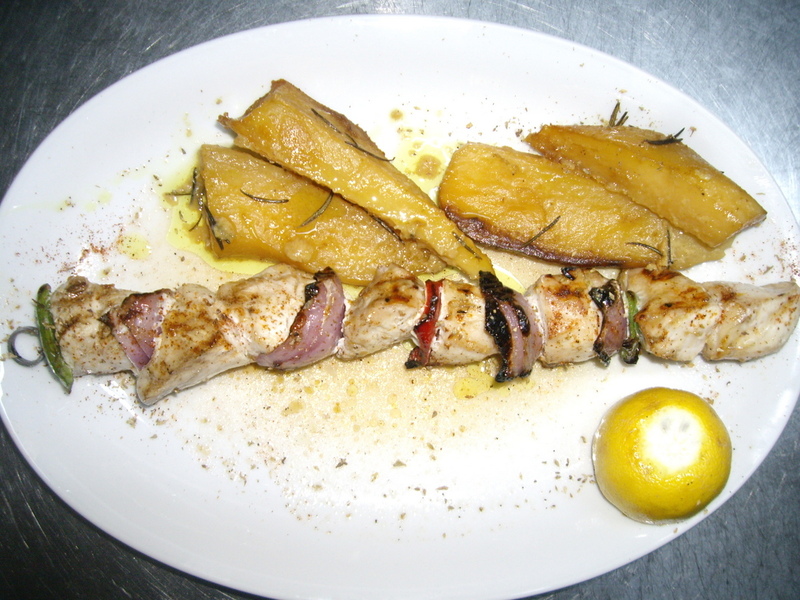 Large pieces of fresh chicken fillet and red peppers cooked on a skewer over the grill, served with potatoes. 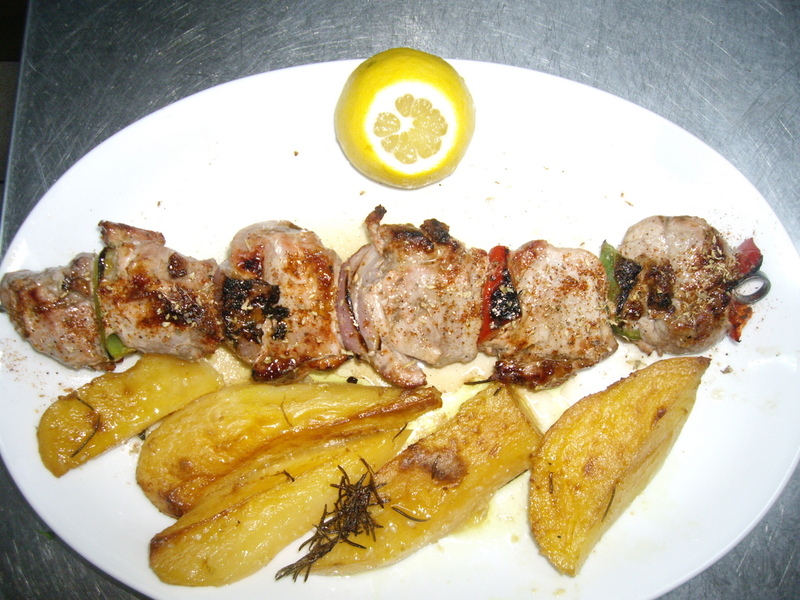 Large pieces of fresh pork and peppers cooked on a skewer over the grill, served with potatoes. Small pieces of grilled chicken on a stick. 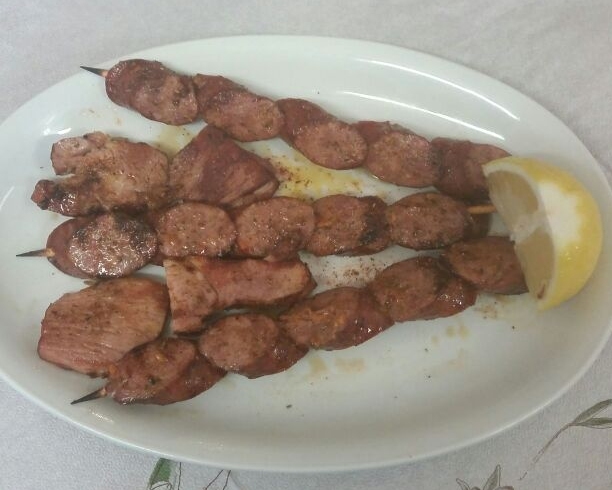 Small pieces of grilled pork on a stick. 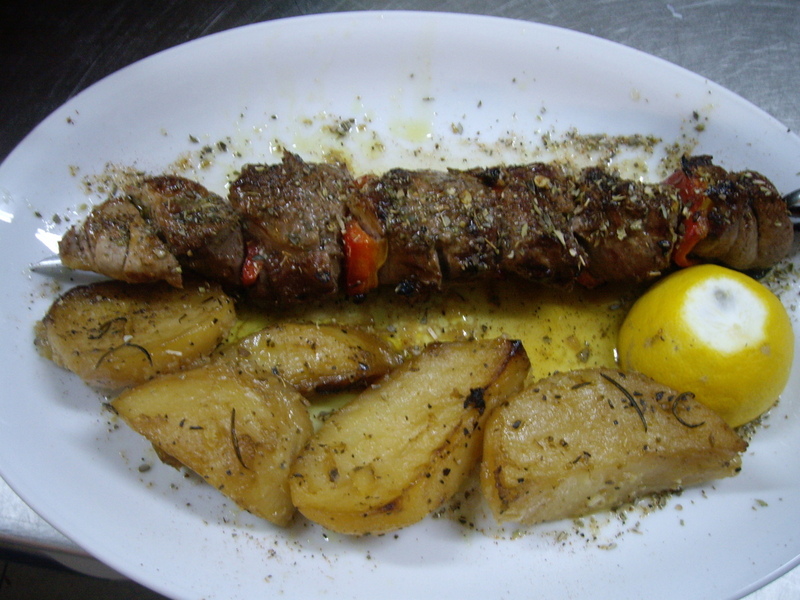 Large pieces of fresh lamb and red peppers, cooked on a skewer over the grill, served with potatoes. 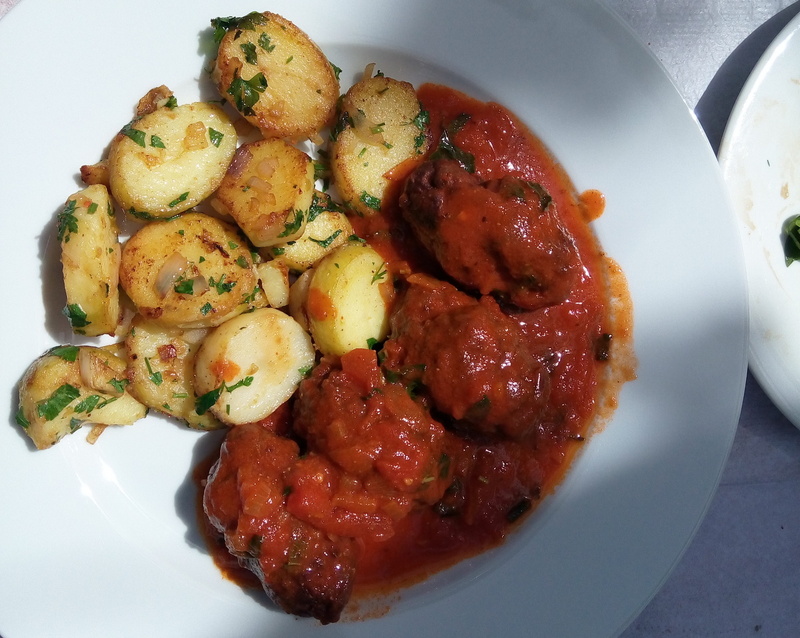 Chunks of fresh chicken, pork and beef fillet cooked on a skewer over the grill, served with potatoes. 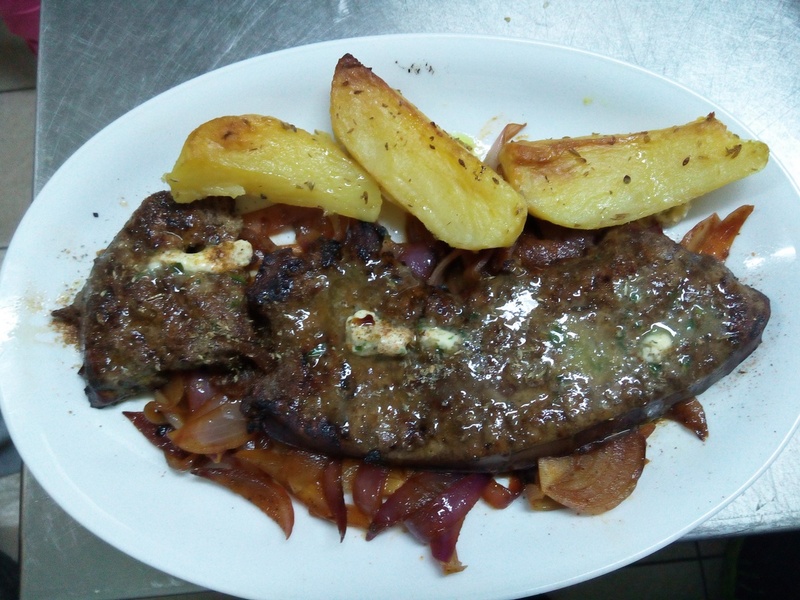 Fresh grilled calves/beef liver served with caramelised onions. 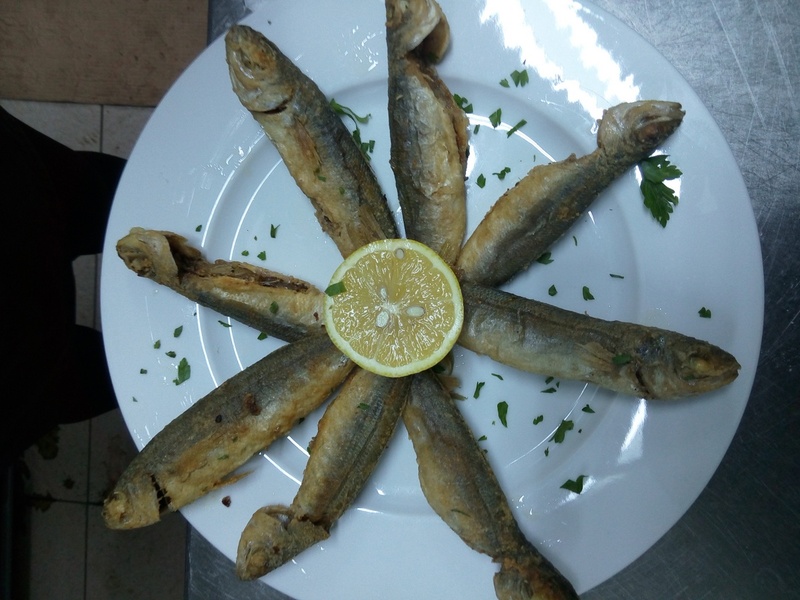 Made with 100% fresh beef, onion, garlic, herbs and spices. 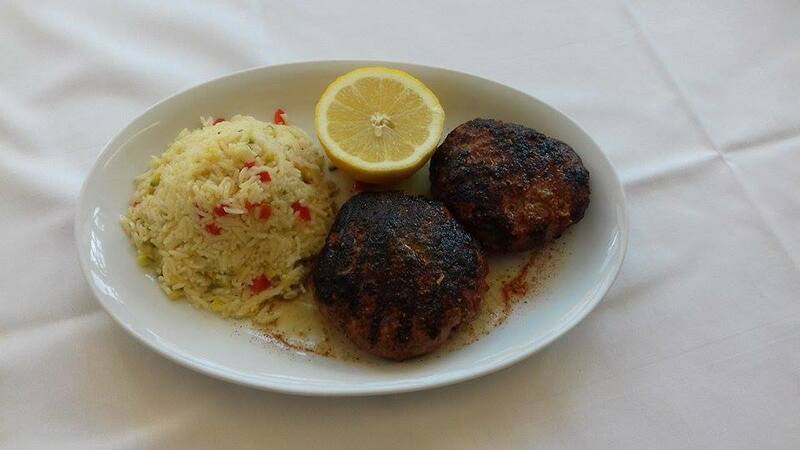 Made with 100% fresh beef, onion, garlic, herbs, spices and stuffed with cheese. Fresh rump/sirloin steak on the bone. 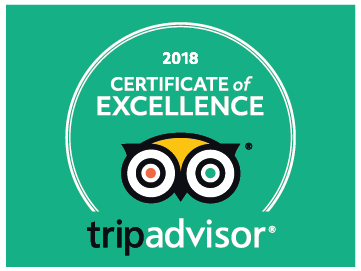 Cooked to your preference. 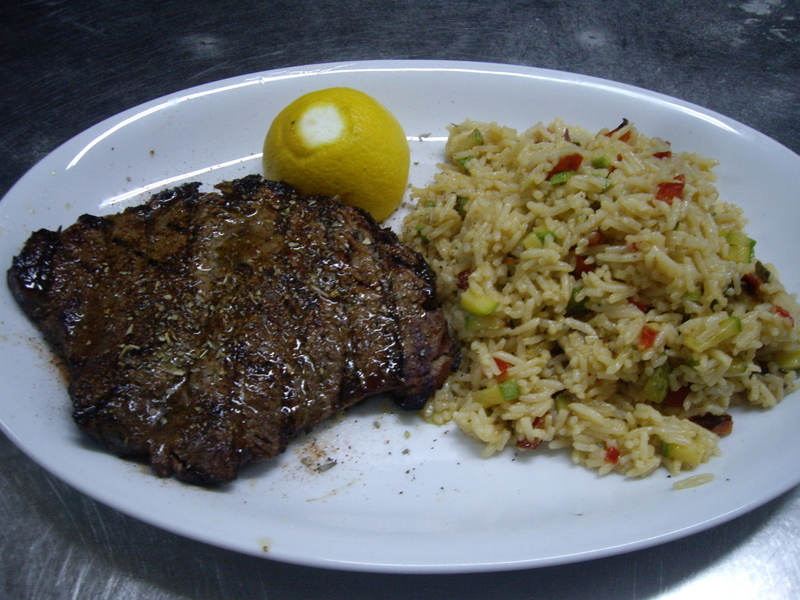 Fresh boneless rump/sirloin steak. 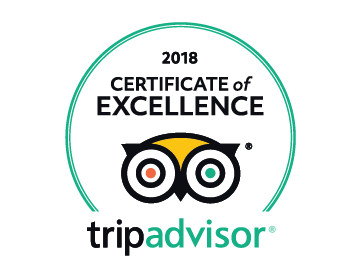 Cooked to your preference. 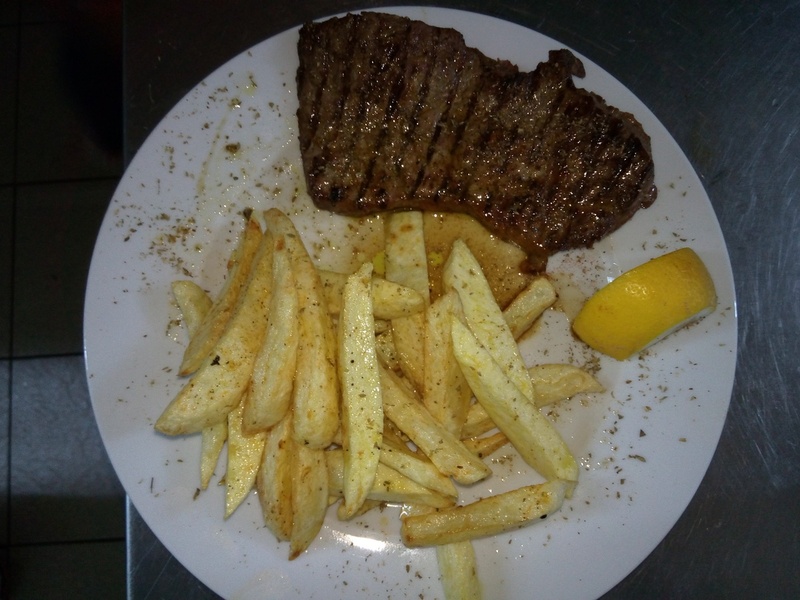 Fresh, quality fillet steak. 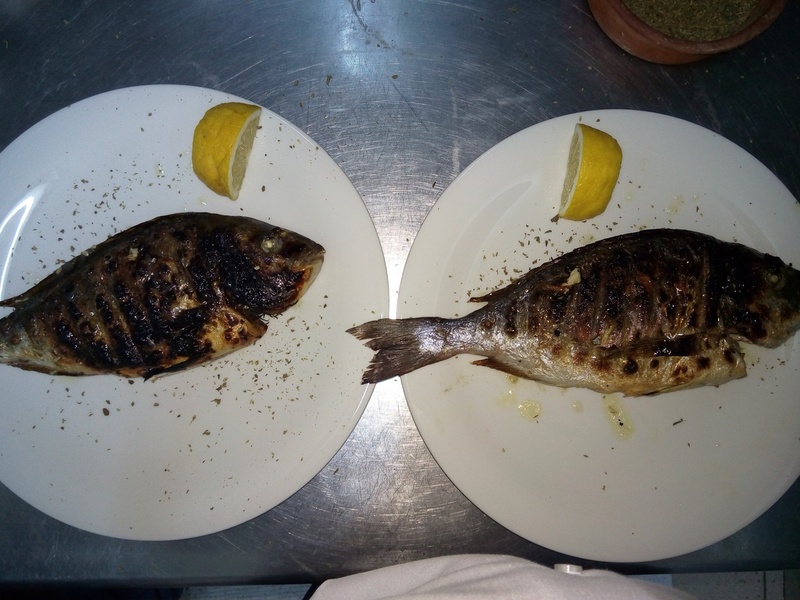 Cooked to your preference. 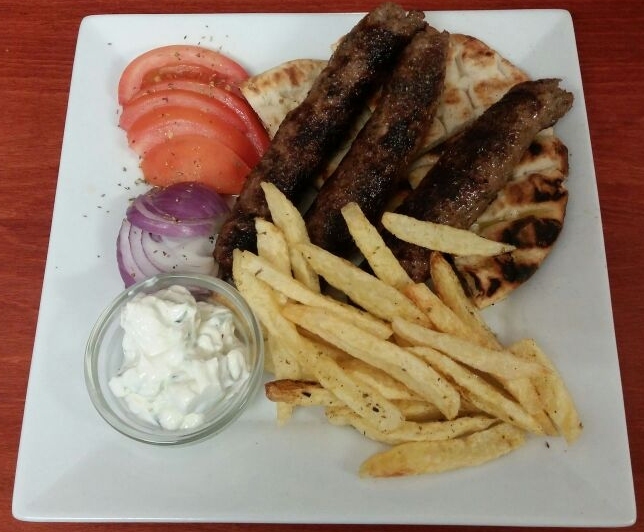 Minced lamb, pork and beef grilled on a stick and served with tzatziki, pita bread, tomato and onion. 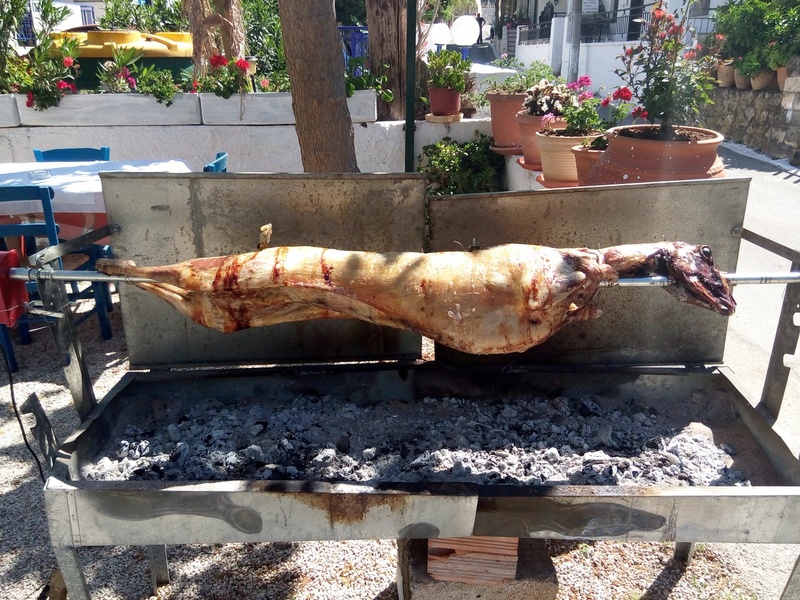 Pieces of lamb marinated in spices then wrapped and spit roasted over a charcoal grill. 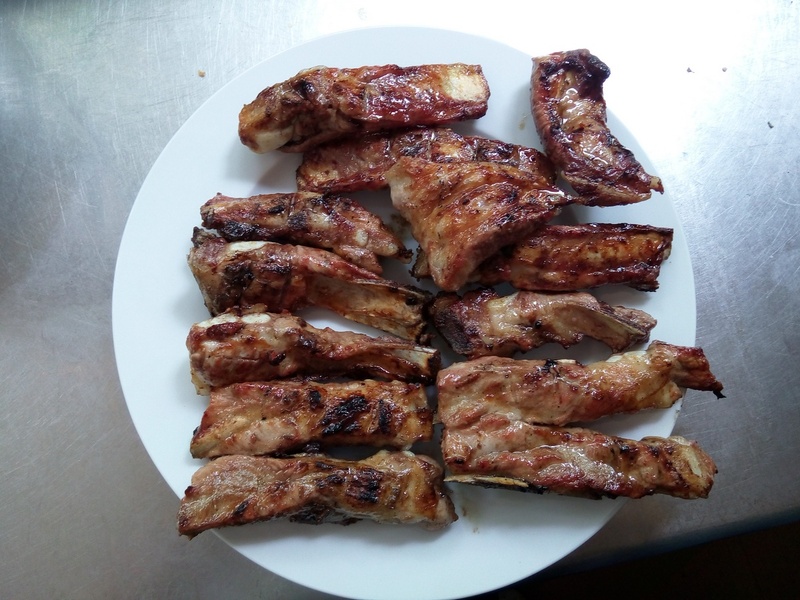 Pieces of pork spit roasted over a charcoal grill. 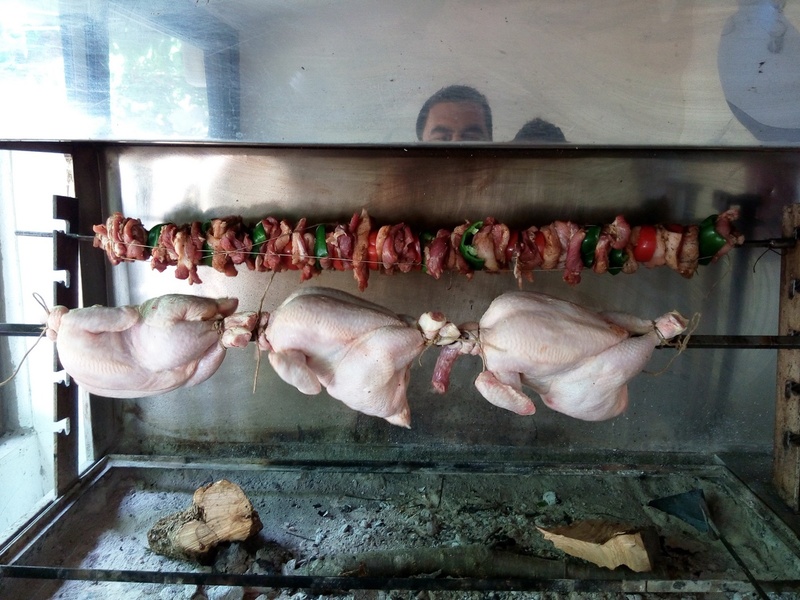 Piece of chicken (bone in) spit roasted over a charcoal grill. 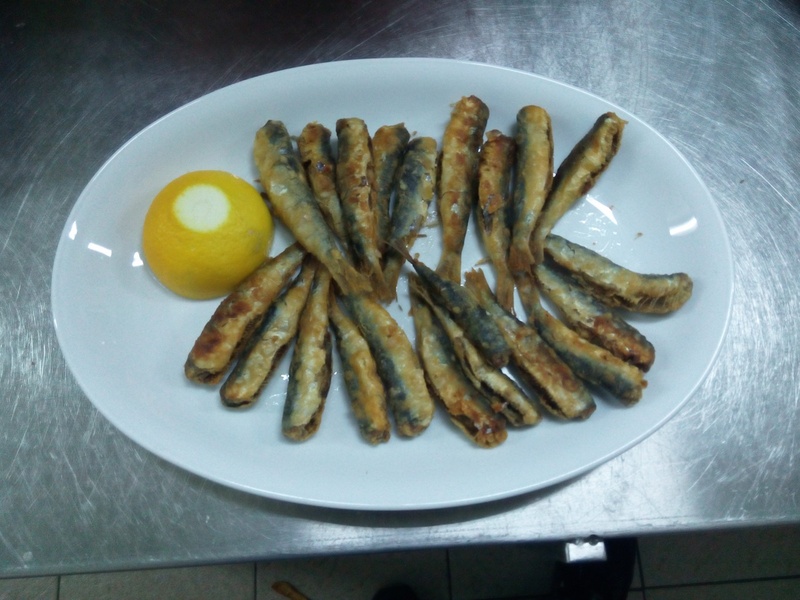 Fresh fried small fishes, average appx 20cm. 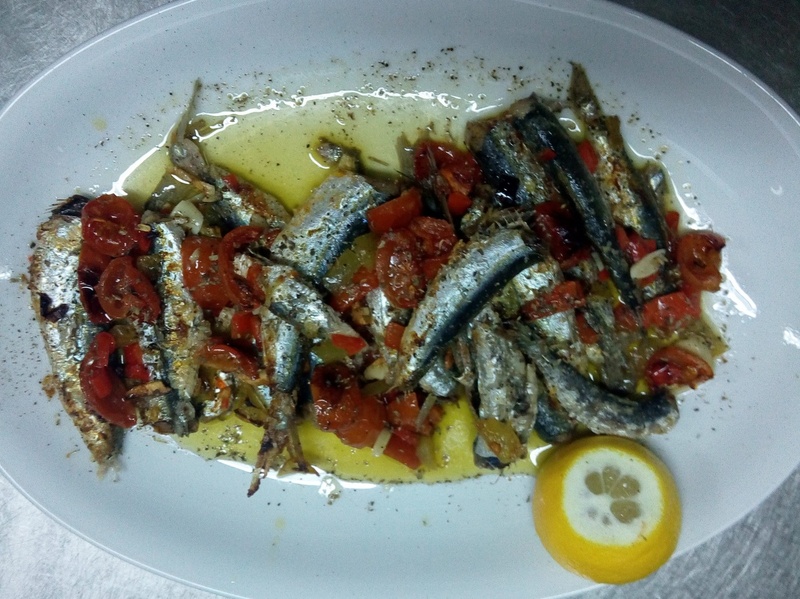 Fresh fried or grilled sardines. Salmon fillet cooked with pieces of chopped fresh tomato, sage and chilli. 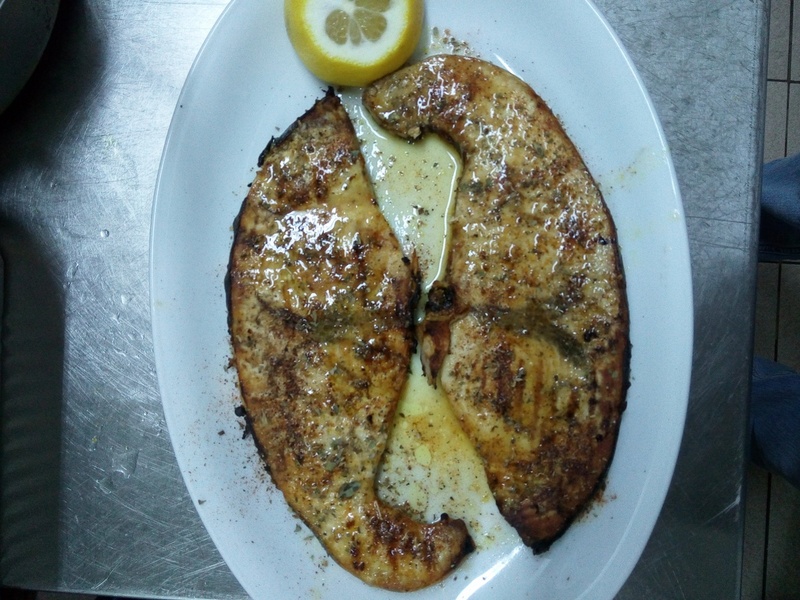 Fresh grilled or pan fried swordfish steak. 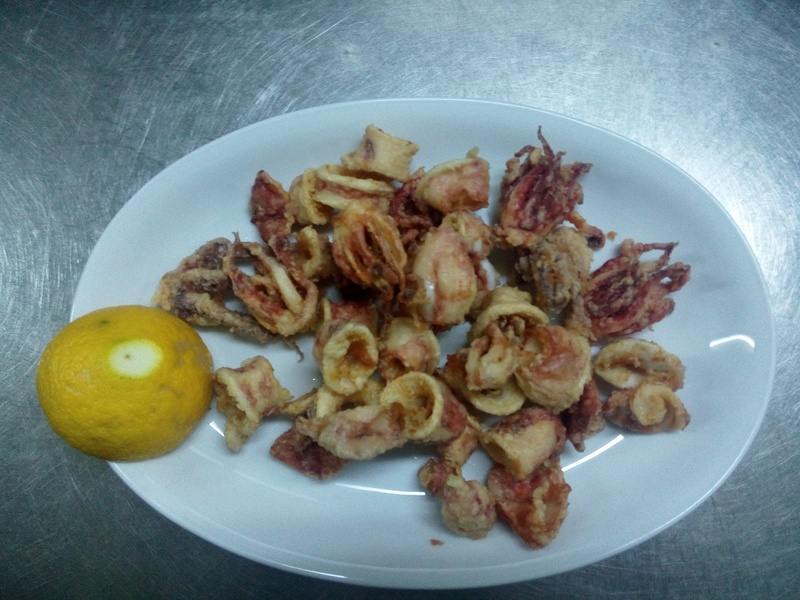 Pieces of squid marinated in spices, dipped in flour and deep fried. Grillled king prawns tossed in a garlic and balsamic sauce served on a lettuce salad. Grilled octopus tossed in garlic sauce served with salad.